This hospital had an European doctor and was exploited by the Billiton Maatschappij. It was called Hospitaal voor behoeftige particulieren. From the reports of the Civil Medical Servicee 1909: At Tandjong Pandan is a hospital for poor private patients. Together with the hospital for sick prostitutes only 40 patients had been admitted in 1909 (1908: 76). The outpatient department treated 742 patients (1908: 498). The number of malaria patients was 107 (1908: 101). In the outpatient department 8 patients were treated with venereal diseases. 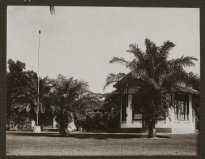 This company hospital still existed at Tandjung Pandang (Billiton) in the 1930s. The picture is from the KITLV collection and dates from 1933 (Collection signature 52972). It was part of an album offered at G.L. Bol on the occasion of his departure from Billiton. Tandjoengpandan was the main town of the department Billiton, Residency Billiton and Dependancies (Gonggryp 1934, p. 1382). The location of the hospital can be found on the Map hospitals 1940.